BPB Top 40 Freeware VST Plugins Of 2014! BPB’s Top 40 Freeware VST Plugins Of 2014! A couple of words about top 3 effects. I had pretty interesting concept of a mixture of parallel equalization and splitband compression in one plugin but the approach was just of pure interest without any realistic vision of final plugin. The plugin was created for KVR Audio Developer Challenge 2014 in a great hurry and under very stressful conditions. Some parts were created in less than a hour and the most complex part of this project was to bring all components together and quickly create some kind of acceptable GUI. So we have what we have. The sound of the plugin is good, the plugin is really helpful in many complex mixing/mastering situations but GUI usability is far from ideal. That’s why we’re going to re-release this plugin with enhanced workflow and with some new features under Tokyo Dawn Labs. Also I’m very happy with my 2nd place on KVR DC14 too! And also thanks to Lesha for the current skin. I can’t say, I did a lot for this plugin. In my opinion the most remarkable contribution from me was complete removal of feedback path (lol) and maybe a little help to RMS part (which led to high CPU usage we finally have). But in GE version I had a great pleasure to implement FDR, variable slope HPF and equal loudness stuff. Also our conversation with Fabien about the name of this plugin was very fun! It was really joyful experience to collaborate with Herbert on this project and to program DSP code for it and also to add such nice things as EQ saturation, Soviet mode and auto gain stuff. For GE version I’m still not 100% sure (about 75% actually) for the decision to add tilt filter instead of the 4th band but finally we have unique linear shape tilt, great workflow I’m happy with and also with such small additions as Japanese mode, a couple more saturation types and new HPF/LPF stuff! I like standard freeware version due its extreme simplicity and I use it a lot (although I have GE version too). The CPU usage is higher than desired but we tried to reduce it in recent 1.1.0 update. Such thing intended to reduce IMD distortions when working on high sample rates. Should I insert it in the beginning of audio processing chain or just before output limiter or after it or between each plugin? I don’t know. I don’t work with high-res. But I like to listen high-res music through it. The depth is greatly increased and mid-range becomes pristine clean. I use this plugin with George Yohng VST Wrapper for Foobar player. 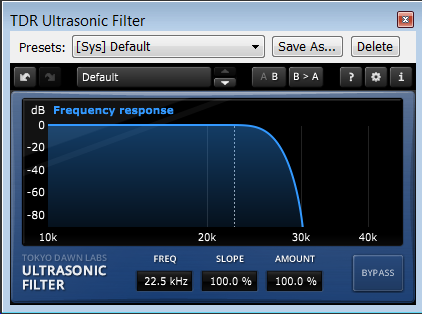 I experimented with the Ultrasonic filter on a just-for-fun master at 96kHz. I had about 10 plugins in a chain (all producing harmonic distortion of various degrees, mainly Acustica Audio Aqua and Nebula instances) and smashed into Voxengo Elephant ridiculously hot (limiting up to 8dB at best). I inserted Ultrasonic filter first in the chain and then after (and thus before) each and every plugin, including after elephant (so actually after the limiting.. just before final dither). The difference is ASTONISHING!! It is so ridiculously obvious and much better with the filters than without. A truly mind-blowing “WTF???! !” experience for me. It basically removed a lot of problems I’ve identified in mixes and previous masters that had heavy processing with a lot of harmonics.. mainly that nasty build up of “ringing” around 2.3 to 4kHz area. It also cleared out the congested mids and lower mids. This is a game changer for me. I will not do any more high resolution mastering without this filtering. Period. Heck, I will never mix at high resolution again without this plugin inserted all over the place. In this video I am showing how you can use SlickEQ to help you identify and remove problem frequencies as well as help train your ear.